Wolfeboro, NH: Don Smith, President of Wolfeboro Rotary Club, presents Steve Hale, President of The Nick Board, with a check for $2,500 on behalf of Rotary's members who want to support The Nick in its efforts to grow its Endowment Fund. This is the fourth installment of a $25,000 Challenge approved by Rotary Members to be donated to The Nick over a 10-year period. These funds are to be used towards The Nick’s Endowment Fund to help secure The Nick in perpetuity for generations to come, providing recreational opportunities for the young and old, and enhancing the quality of life in our community. Each year The Nick works hard to find a matching donor to meet this challenge. This year the $2,500 challenge was met through personal contributions made by The Nick Board and Staff members. Pictured left to right; John Pernokas, Steve Hale, Alex Hunt, Don Smith, Holly Williams Aucoin and Ivette Babylon. 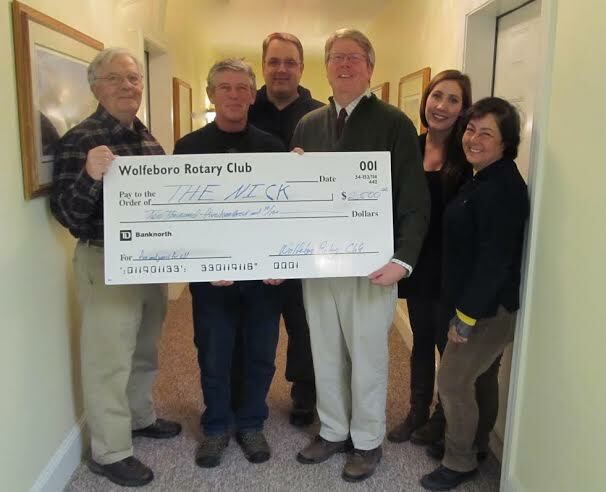 The Rotary Club of Wolfeboro meets each Monday at 5:30 p.m. in the 1812 Room of the Wolfeboro Inn. Following a light dinner, members hear a guest speaker on various topics of interest. Interested men and women are always welcome to come and learn more about the benefits of joining Rotary. To learn more about the Wolfeboro Rotary Club visit www.wolfebororotary.org.